I am writing you to alert you about the significance of the Ohio Supreme Court and how their actions can dramatically affect the economic vitality of Ohio. "As a small business owner your opinion is greatly valued by people in the community, and your involvement in educating your family, friends and colleagues may ultimately be the difference in who wins or loses an election. Please find below some information that highlights the importance of the Ohio Supreme Court races." Judicial restraint, when judges use their positions on the bench to interpret Ohio law, is vital to all of our court systems and it is particularly important on the Ohio Supreme Court. It's time to send Justice Evelyn Stratton and Justice Maureen O'Connor a message that you agree with their judicial philosophy - that is, one of restraint. In past years, a majority of the Ohio Supreme Court demonstrated a pattern of judicial activism, using their position on the Court to make new laws, sometimes called "legislating from the bench," that has had a substantial negative impact on Ohio's businesses and their employees. Among those activists' decisions was the throwing out of important reforms to Ohio's civil justice system, encouraging frivolous lawsuits and making it even easier to sue in Ohio. The Court's past liberal majority also made decisions that have negatively affected workers' compensation reform, and insurance coverage - all of which make it even more difficult for small businesses to create new jobs, or increase wages and benefits. 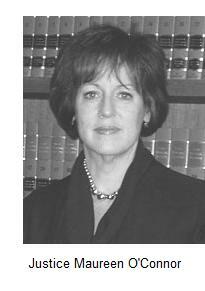 · An understanding of the Court's role in interpreting Ohio law. While it may seem that the Ohio Supreme Court is a long way from Main Street, the decisions made in the highest state court have a far-reaching impact into our homes and businesses. All Ohio taxpayers pay the price for the economic risk caused by the actions of the liberal majority on the Supreme Court. When our state's economy suffers, prices for consumer goods and services increase and Ohio's job market is at risk. That impacts everyone, but is especially threatening to our state's small businesses and their employees. Evelyn Stratton and Maureen O'Connor work every day to keep a balanced approach to jurisprudence in Ohio. Contact Evelyn Stratton and Maureen O'Connor and tell them you agree with their philosophy of judicial restraint! Thank you for your time and consideration on this important issue.